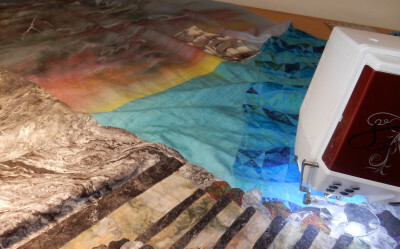 Have you ever had a quilt that struggled with you to the point you nearly abandoned it? Well, that was the second in my “Waiting…” series, but I picked it up and did some substantial fixing, and now I am at the point of coming close to finishing the top and I love it at this point. First of all, I pieced a storm at sea section to become part of the ocean. The piecing was challenging, but enjoyable and I liked the way it came out. Here are the first two blocks of that section. When I put it together with the fabric piece had for the rest of the ocean, and added the sky, the whole background piece seemed disjointed and the colors simply didn’t play well. So I took the ocean off the sky and overdyed the ocean (both pieces joined together) with a more sea-like color and they blended beautifully together. 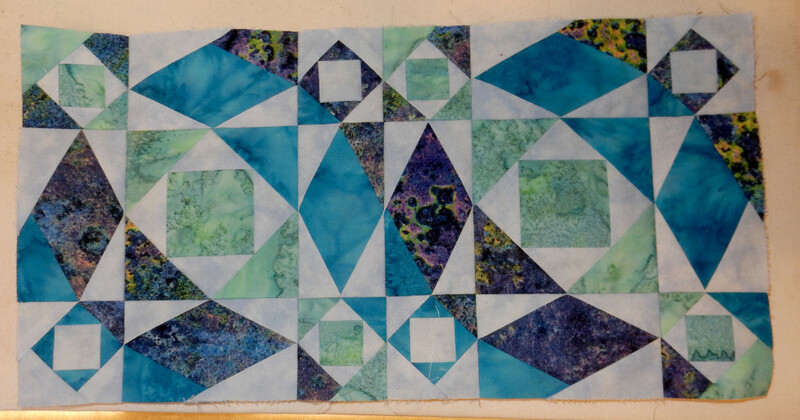 The only negative result is that, even though I hand dyed it, the pieced storm-at-sea blocks’ seams tended to fray together, so I no longer had the nice flat open pressed seams I started with. But really, by the time I spent several hours re-flattening and spray starching the sea, it looks wonderful. But the sky…oh the sky. It was just too dull and gray and lifeless. I wanted a sky with an obviously approaching storm at sunset, just as the clipper ship can be seen on the horizon. This is to add the drama to the story…can the ship make it into port safely, and will the family be reunited and get into shelter before the storm hits? I had tried painting that sky three times already, and I didn’t like any of them. So I took the one I liked the best and added clouds, lightening, sunset colors, and yes, I think it now has the drama (and color) I was hoping to add. So I put the sky and the ocean back together. Here is a quick pic of the ocean after I dyed it and got it back together with the sky. Then I added the cliffs to the left of the picture and it began to look right. I just put in a lighthouse on the top of the farthest away visible cliff, added the rocky steps and the stone platform in the nearest stony area for the woman and her daughter to stand on and surrounded it with stones as it would be. It has made all the difference. I now finally like the quilt top. 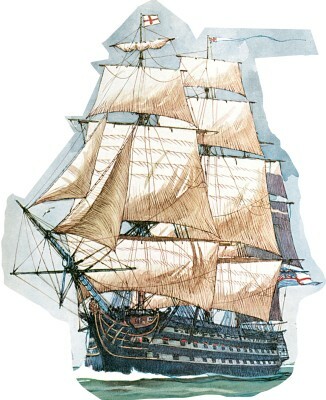 But I was not happy with the original clipper ship I had chosen to use. I am using a Dover high-definition painted ship and I have the collection. 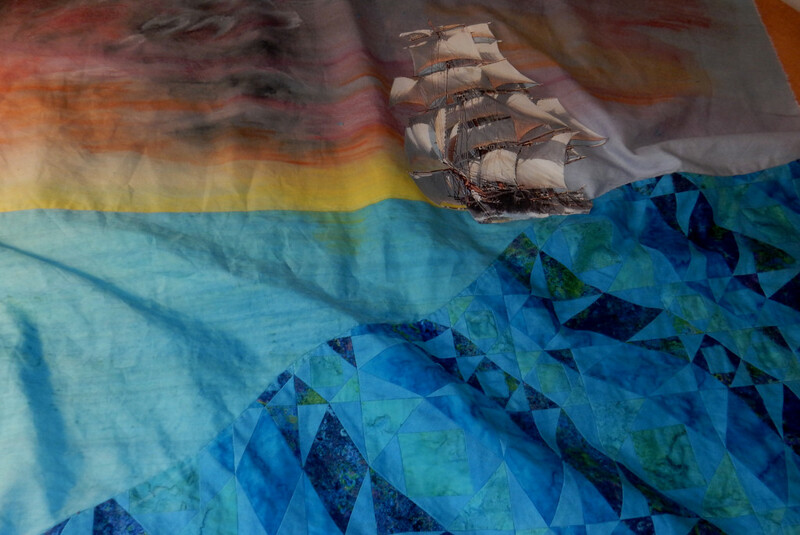 They are much more beautiful than I could have made from scratch, and I don’t mind using commercially printed fabrics, so why should I mind using a fabric I print myself from a collection of great nautical paintings. Using this still requires considerable advanced techniques in applique, thread work, and quilting. The ship I decided not to use. So I hunted through the collection and found another one, which I printed out about five different sizes, and finally got it about right. I like this one. 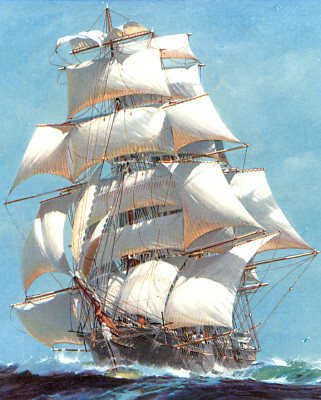 It has life, the sails are billowing and are a better color. I’m slightly leaning it on the quilt to add to the look of speed. I printed it out both on the EQ regular cotton fabric and the EQ lawn. I am appliqueing the whole ship down from the cotton fabric, and have added wool batting to the back of the front sails and will applique those in place to give it a bit of 3D billowing sales. I am also adding a layer of wool batting behind the ship and trapuntoing it all in place. Then I will stitch the rigging. That will probably take me a couple of days to applique and another stretch of time to do the quilting and stitch the rigging. Here is my machine stitching around the stones and stone steps up to the platform where the woman and her daughter will stand. Then there will be the stirring up of the sea with some Angelina fibers and some thread work. That will be fun. Sew happy everyone! Wishing you all a wonderful National Quilting weekend, and a happy Palm Sunday on the morrow. Tags: B.J. has more she wants to share but some of it is a secret project, Having fun in my studio, heart tugs, How fun is this!, I love comments., Waiting... series, What is that crazy B.J. doing now?